Martin Luther by Lucas Cranach 1528. 1510 – Luther is sent to Rome on monastic business and sees the corruption of the Church. The disputation protests against clerical abuses like pluralism, absenteeism, baptism and the sale of indulgences (the idea that people could buy a place in heaven for their souls, and to forgive their sins). 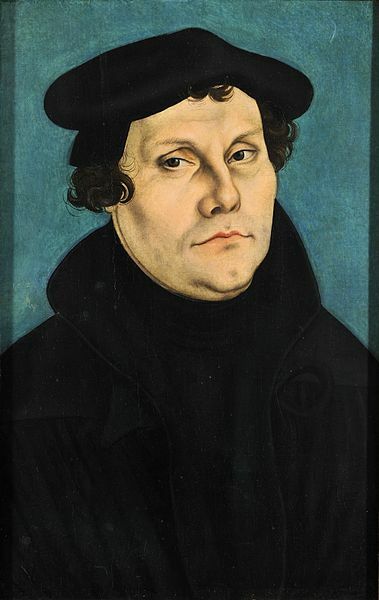 1518 – Luther defends his beliefs in front of Augustinians, and refuses to recant. Frederick the Wise protects him from being handed over to Rome. 1519 – Luther debates papal infallibility and begins a New Testament sermon series. To the Christian Nobility of the German Nation was written saying that the reformation was required by God, but it was neglected by the Pope and the clergy. The laity did begin to question the Church’s authority. On the Babylonian Captivity of the Church outlined the seven sacraments of the Catholic Church, within his own interpretation of the Bible. On the Freedom of a Christian developed the concept that Christians aren’t compelled to keep God’s law, but they serve God freely and willingly. 1521 – Luther is excommunicated and begins his first translation of the New Testament. The Diet of Worms where Luther refuses to recant. First Lutheran books appear in England. 1522 – Anabaptist movement begins in Germany. Luther’s New Testament published. 1524 – William Tyndale travels to Germany and enrols at the University of Wittenburg. This was a response to Erasmus’s publication denouncing Luther. The major issue was whether humans are free to choose good or evil. It was one of the first debates over predestination and free will. 1527 – First Protestant university founded in Marburg. The pamphlet accused the Roman Catholic Church of murder and treason among other things. He argues that people shouldn’t pay taxes to Rome, he speaks out against purgatory and the sales of indulgences and accuses the clergy of trying to usurp the power of the state. 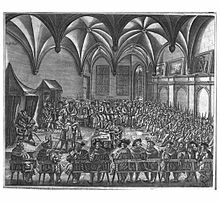 1530 – Philipp Melanchthon, a collaborator with Luther, presents the Augsburg Confession, a statement of Lutheran arguments. The Schmalkadic League is formed by Protestants against the Emperor Charles V.
1534 – Luther completes the translation of the Bible into German. Strassburg decrees that Anabaptists must leave the city. 1535 – Tyndale is arrested and imprisoned near Brussels. William Tyndale was betrayed to the Imperial authorities. Thomas Cromwell attempted to intercede on his behalf but was unsuccessful. He is eventually strangled and then burned at the stake for heresy after a 15 month imprisonment. 1539 – Frankfurt declares a truce between Catholic and Protestant areas. 1545 – Luther writes Against the Papacy at Rome. 1553 – Many Protestants who fled England when Mary I came to the throne ended up in Germany, experiencing a ‘true’ Protestant reformation. The Book of Martyrs is the only exhaustive reference work on the martyrdom of Protestants from the 1st century to the 16th century. for such info much. I was seeking this particular info for a long time. Wow, thank you. I actually did the variety of Reformation timelines for my Masters degree, so hopefully they should be quite useful!